Furthering the running gag that Microsoft is slow to the draw and deficient in apps in regards to its smartphone platform, Minecraft: Pocket Edition is just now heading to Windows 10 Mobile. 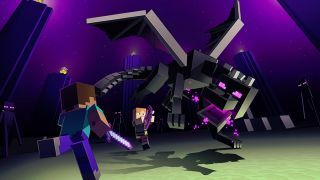 Though previously available on Windows Phone 8, Minecraft developer Mojang dropped support for Microsoft's older mobile OS back in October of last year. Minecraft: Pocket Edition's arrival on Windows 10 Mobile now means those who've upgraded will also finally catch up on major updates that they have missed out on since, including Achievements and support for Realms, add-ons, and texture packs. The ultra-popular brick building game coming to Windows 10 Mobile may as well just be a formality at this point, with the game already selling over 100 million copies and counting, and the handheld Pocket Edition and console ports outselling the PC original almost 2 to 1. That said, it's still amusing to think that one of the latest systems to just now get in (or rather, back in) on one of gaming's biggest, best-selling brands is Microsoft's own, considering it owns Minecraft after purchasing Mojang for $2.5 billion back in 2014. Thankfully for owners of the previous version, anyone who purchased the game for Windows Phone 8 will be able to download the Windows 10 Mobile version at no additional charge.